Under the Never Sky was better than I had anticipated. I’m so glad I decided to read this book. I wanted to see what all the hype was. At first when I started Under The Never Sky, I wasn’t connecting with the characters or the world that was heavily developed in the first half of the book. I stuck with it and I’m so glad I did. Like I said, the beginning was heavy with world building but it was necessary in order to understand the world these people lived in and what obstacles they were facing. Aria lived in a Pod which was heavily structured to protect the people inside from the Aether that is in the sky. Not only the threat of Aether, but they are protected from disease and illnesses. Being so protected they are oblivious to the dangers that are beyond the Pod. Aria’s mother Lumina has gone to another Realm, Bliss. The communication had been cut off and Aria wants to find information so she seeks this from the Counselors son, Sorren. In the Pod everyone wears a Smarteye which is suctioned to an eye and allows them to faction into made up Realms. You could go to just about any century or atmosphere your heart pretty much desired. For example, if you wanted to be in a Renaissance era, you could faction into what resembled just that. Sounds fun to me, but they live in this world where it’s so perfect that they truly are oblivious to the “real world” and what’s going on out there. Aria crosses a path with a “savage” while on her pursuit to obtain information on her mother from Sorren. His behavior becomes strange and the repercussions of his actions change Arias life forever. This is written in multiple POV’s. Aria and Perry (savage) When their lives entwine the story moves forward and the connection to the characters deepen. There are multiple lives and relationships that we follow, but it is easy to get invested in each one. Aria being tossed out into the outside. Perry has an internal conflict but not only that, his nephew Talon was taken by the Dwellers (people in the Pods), and a new character is introduced which is Roar. He wants to find Liv, Perry’s sister who has ran off due to a particular situation. The story made a huge turn for me once Roar entered the pages. I loved this character and he was amusing. Another character that enters about the same time as Roar, is Cinder. He plays a vital role as well in this story. Perry has Aria’s Smarteye but they need to get it fixed so they travel to a friend of Perry’s, Marron. On the journey Aria learns that these savages can have special abilities. Some are Marked and some are not. For instance, Scire. Scire’s can smell emotion. Auds have impeccable hearing and said to be sly. 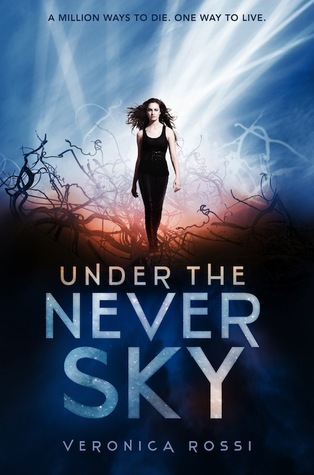 Under The Never Sky was such complex but very intriguing read. I don’t know why I waited so long to read this but I’m so glad I did. The story is rich in world building, and the characters are intriguing and well developed. Aria is a strong protagonist. Perry is swoonworthy and very masculine. He’s tough but along the journey develops a soft spot for Aria. Their connection is slow growing but very addicting. This is one dystopic adventure you won't want to miss out on. I wanted to read this book for so long! I'm glad you liked it! Now I definitely need to read it! Thanks for a review! This is an awesome book, isn't it? I absolutely loved this one and I am so happy you did too. Wonderful review.